Earlier this year NECA revealed that they’ll be doing a two pack of Kratos and “Boy” Atreus. Since it was announced I’ve been highly anticipating this two pack. And now that I have played the game I want it even more! Kratos is easily one of my favorite figures that were released this year and I don’t doubt this will be one of my favorite purchases of next year. 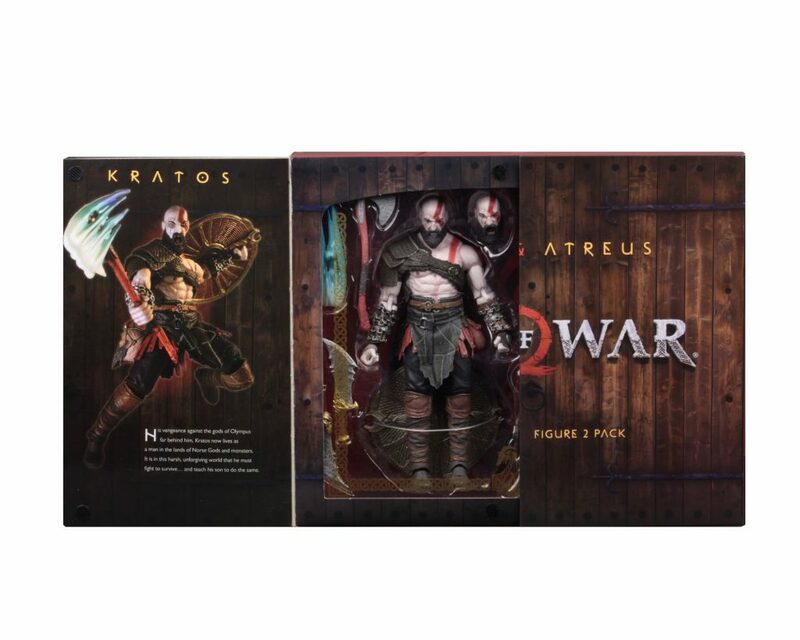 I absolutely love this packaging of this two pack, especially because of the slide open panels on the front revealing Kratos and Atreus inside. 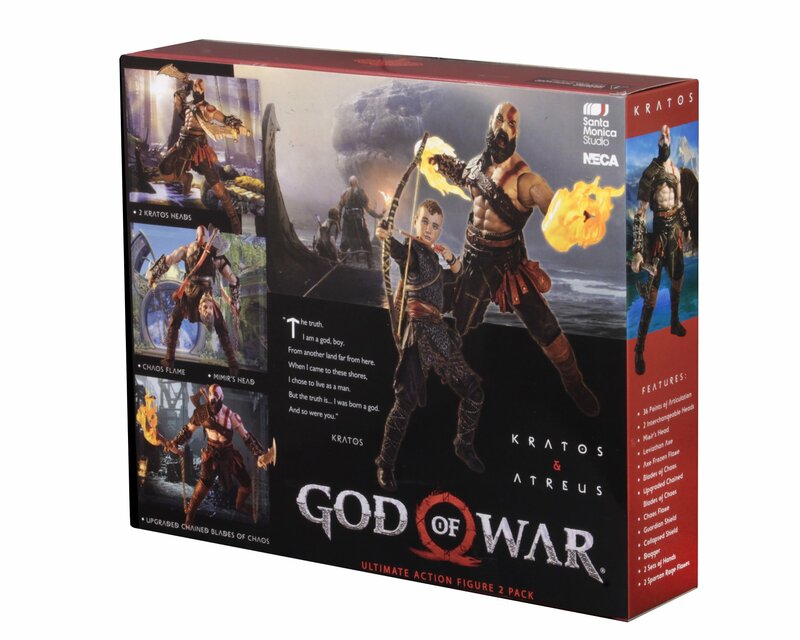 On either side of the packaging, there are images of Kratos and Atreus listing the accessories that they come with. 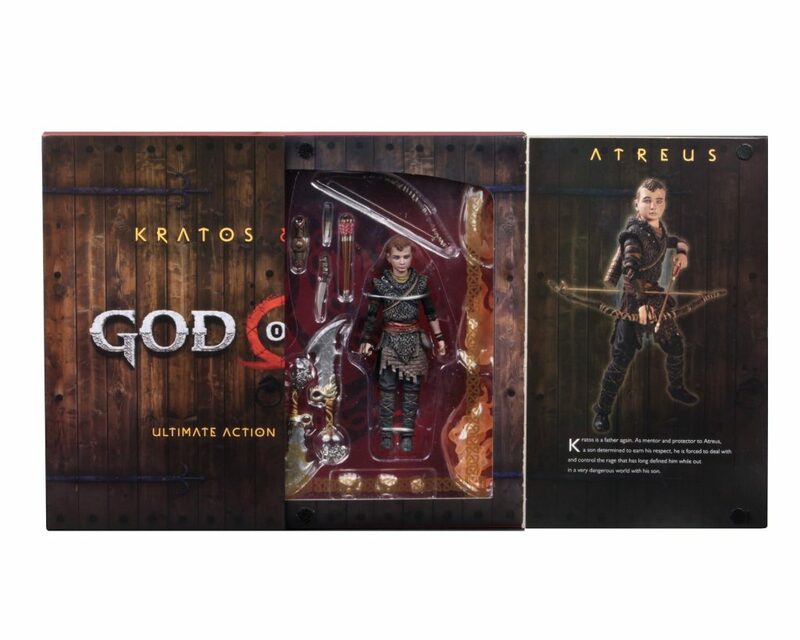 Atreus comes with his Bow, Arrows, Quiver, Dagger and three interchangeable hands. 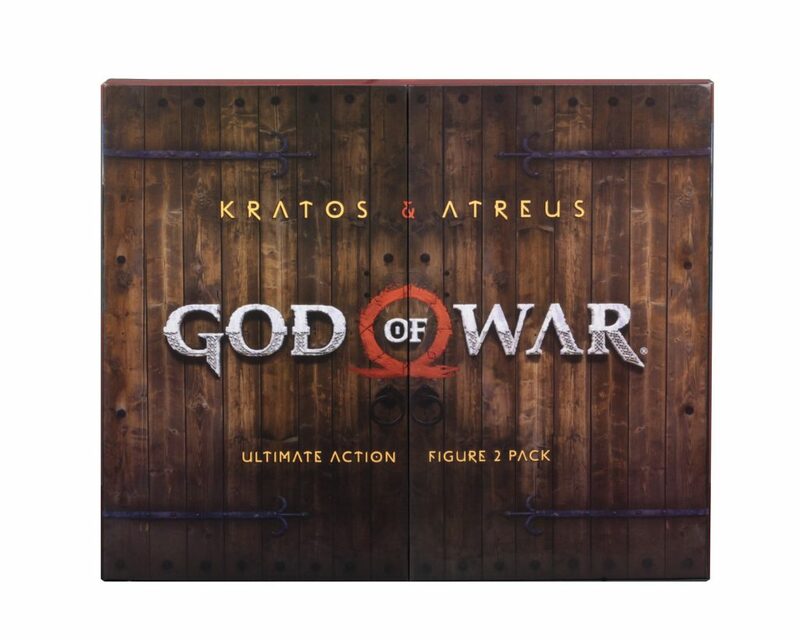 Kratos comes with his Leviathan Axe, Blades of Chaos, Upgraded Blades of Chaos, Guardian Sheild, Collapsed Guardian Sheild, Dagger, Leviathan Axe Effects, Mimir’s head, Chaos Blades Effects, Spartan Rage Fist effects, Interchangeable hands, and Interchangeable Angry Head. As you can see this two-pack is absolutely stacked with accessories. 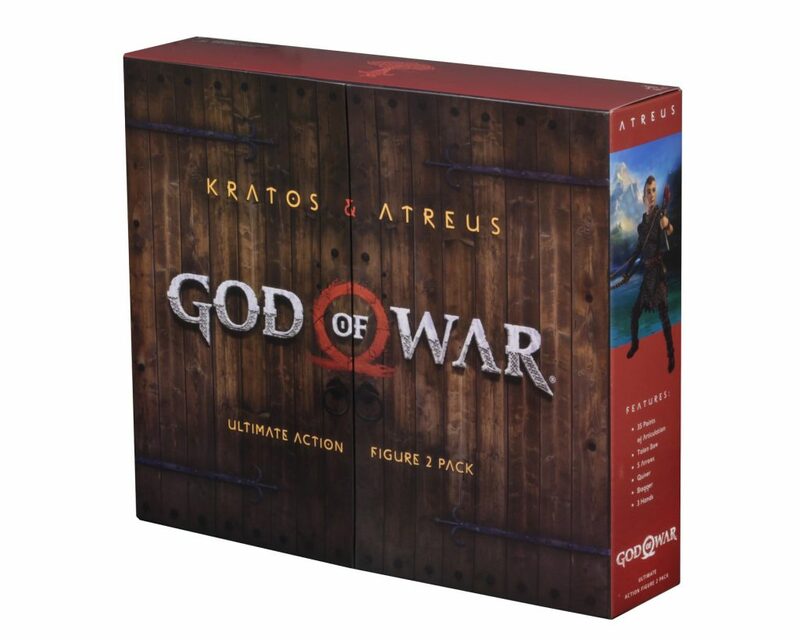 They’ve also sculpted chains on Kratos’s gauntlets and sculpted Mimir’s head on the back of his right hip. Nor did I know that they would come with so many accessories either! It’s great that I can have two Kratos’s on display one from the start of the game and the other from about the halfway point. One will be displayed with Atreus and one on his own. 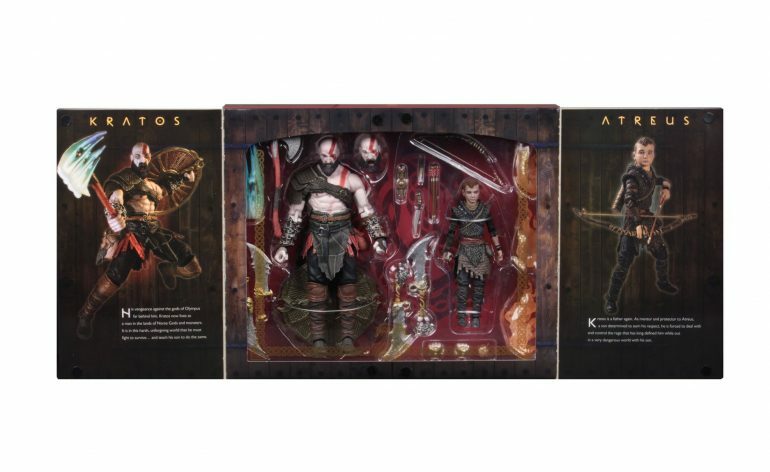 This set is an absolute must-have if your a fan of the video game and a fan of NECA’s God of War figure. This set is expected to be released in January 2019.